We’re excited to announce the recent acquisition of Evolve Architecture, a leader in interior design in Virginia, to enhance its offering to include interior design, space programming and planning, and move management services. United by a common culture, we share a commitment of customer service and first class communication. Together we have delivered excellence in the fields of architecture, design and construction for over 100 years. The regional expansion in Richmond, VA represents Wendel’s commitment to the mid-Atlantic region and surrounding communities. Joining the Wendel team are 14 professionals, including co-founders RoseMarie Bundy, CID, IIDA, expert in interior design, Randy Blankenship, AIA, NCARB, LEED AP. It’s lurking everywhere. Slowly moving, flowing into sewers, streams, puddles—contaminating every waterbody it touches. Large rain events and inclement weather force its movement, thrusting it into our water supply. where. These destructive nutrients are a monster that compromises the water we use recreationally—hiding in the pools we swim in, the lakes we canoe on, and the water we drink. It produces deadly environments. Years of excessive nutrient pollution can lead to toxic algae blooms that pose health risks for humans who come in contact with them, and kill ecosystems, permanently disrupting the food chain as we know it. The answer is to wage unconventional warfare in the form of green infrastructure. 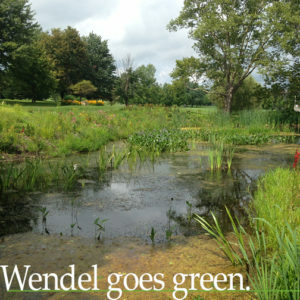 Green infrastructure is an approach to water management that protects, restores or mimics the natural water cycle. It is an effective and economical solution, enhancing community safety and quality of life. It encompasses shoreline protection, native plantings, sediment traps, constructed wetlands, bioswales, streambank stabilization and stream restoration, to name a few. These techniques divert harmful nutrients from water sources and/or filter exposed waters prior to being discharged back into the environment. But most of all, we can help by not feeding the monster. Use best practices and eco-friendly fertilizer and pesticide alternatives. Get involved with local organizations dedicated to protecting the quality and quantity of drinking water.